I never did receive an invite to the royal wedding of Prince Harry and Meghan Markle. Maybe my invitation was lost in the mail, but one lucky guy from the Beach attended the ceremony at Windsor Castle in May. 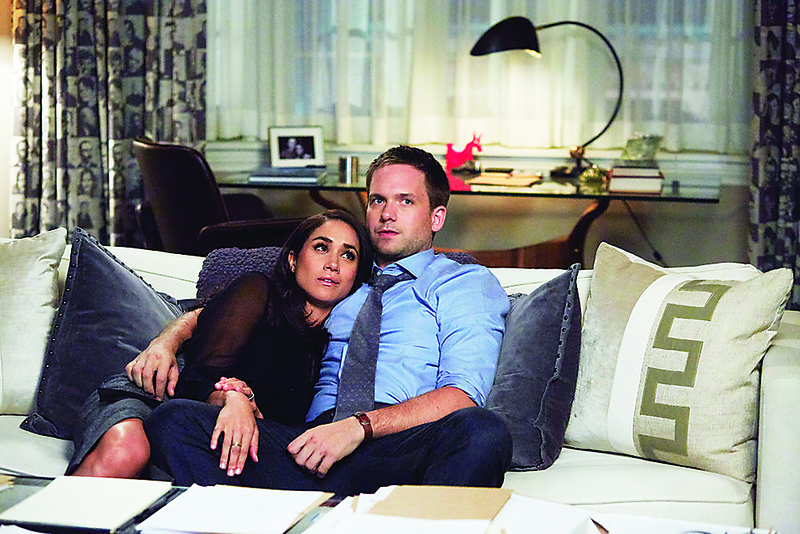 You could even say Patrick J. Adams walked the future Duchess of Sussex down the aisle before the Prince, albeit on the TV show Suits where he played the love interest to Markle’s character. The two finally tied the knot on the seventh season of the Toronto-filmed series and rode off into the sunset and off the show. In real life Adams had his own dream beach wedding to Pretty Little Liars actress Troian Bellisario last December. The two are starring together in the new sci-fi drama Clara which premiered at TIFF last week. Adams plays an obsessed astronomer who searches for signs of life outside of earth’s cosmos while his own life falls apart. Most of us don’t marry a prince or princess in a castle, but the circle of life works in mysterious ways in the universe. Patrick’s maternal grandfather, Cedric Marsh, moved to Canada and became an engineering professor at Concordia University in Montreal. A world-class scholar, he co-invented the tuning fork-shaped football goalposts used by the CFL and NFL. Patrick Johannes Adams was born August 27, 1981 to Rowan Marsh and Claude Adams, a journalist, foreign correspondent and documentary filmmaker who co-authored the 1981 book, The Canadian Caper, which told the true story of our diplomats hiding Americans during the 1979 Iran hostage crisis —and don’t get me started on the bogus, Oscar-winning, Hollywood version, Argo. The Adams family settled in the Beach area of Toronto, living on Silver Birch Avenue and then for many years in a cozy bungalow on Leonard Circle (near Lee Avenue) while Claude Adams reported from around the world. Claude Adams passed on his love of storytelling to his son. Patrick wanted to be an actor from an early age. When it came time for high school he heard about the theatre arts courses at Northern Secondary and decided that was where he had to be, even if it meant long hours on the TTC from his home in the Beach. Clara was filmed in Toronto in March 2017. In the trailer there is a scene outside the shuttered McLaughlin Planetarium where many a pupil once looked up at the stars. Someday we may only have celluloid images and fond memories of buildings that are long gone. I will admit that our little community may not be the centre of that universe, but we have our own stars. So many talented, creative people have called the Beach home. Somewhere out there is a kid with dreams of becoming a director like Norman Jewison or Gail Harvey, a painter like Doris McCarthy, a writer like Fred Bodsworth, a musician like Glenn Gould, an athlete like Bruce Kidd or Penny Oleksiak. A new generation of Beachers (Katie Boland, Atticus Mitchell, Jamie Johnston) are up-and-coming. Try to catch Dalmar Abuzeid in Anne with an E which premieres on CBC on Sept. 23 at 7 p.m. Abuzeid was born in the Beach in 1990 and grew up on Waverley Rd. He plays the first black character to appear in the Avonlea of the classic Anne of Green Gables stories.